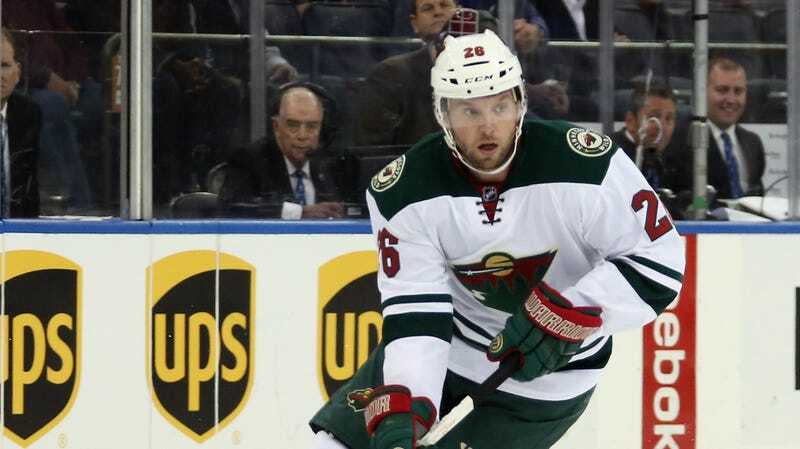 This summer, Minnesota Wild winger Thomas Vanek found himself caught up in a federal case against three men accused of running a gambling ring out of an Upstate New York bar. Vanek, who played nearby in both Rochester and Buffalo, served as a witness, but his link to the alleged bookies was unclear. This should make things clearer: one of the defendants admitted laundering a big ol' gambling debt from a certain hockey player. As two of the defendants await trial, a third, Mark Ruff, pleaded guilty yesterday to illegal gambling and money laundering. In an interview with NBC-10 News in Rochester, Ruff's attorney indicated that Ruff laundered a $230,000 check from the Islanders, apparently signed over to the gambling ring by Vanek. We're told the check was made while Thomas Vanek played for the Islanders and when we talked to Ruff's attorney, Jim Wolford, he revealed to us that the check came from the New York Islanders hockey club. Wolford said, "The check that was identified, as far as the money laundering, was a New York Islander check." Berkeley Brean asked, "What does that mean?" Wolford responded, "Thomas Vanek was here... What? A couple months ago? I think at the last hearing he was playing for the Islanders." We asked Wolford, "So you're saying that check came from Vanek?" He said, "It came from the Islanders." "Put it this way," said Wolford. "I was a little surprised when I heard in the news that Mister Vanek was claiming complete innocence with respect to this entire operation." The timing would make this a recent debt. Vanek was traded to the Islanders on Oct. 27 of 2013, and shipped out on March 5, 2014. The prosecutor's office refused to confirm whether the check came from Vanek, but earlier today Vanek's agent told the Star Tribune that Vanek was paying off a debt accrued from betting on football. Vanek's agent, Steve Bartlett, told the Star Tribune Friday that "Thomas is not in any way, shape or form involved in any illegal activities or in trouble here. "Now people are like, 'Oh, Thomas was a money launderer. That's totally false. He was the bettor. He bet on football games. Obviously that's what he was testifying to. It doesn't take Einstein to figure that out." Vanek isn't accused of doing anything untoward other than being bad at picking NFL games, but the NHL said today it is monitoring the Rochester case.